Wedos Review 2019: Is Wedos a Good Hosting? WEDOS is a Czech Republic hosting service that is cheap and offers a simple website hosting package with a 7-day trial period. WEDOS is based in the Czech Republic and is the largest website hosting services provider in the country. With its 13 years of proven service, they have made a name for themselves in reliability, safety, and quality. Though their services at the moment are mostly limited to the Czech Republic, Poland, and Slovakia, they are planning to extend to other parts of Europe and the world. Their website is offered in English, Czech and Polish. WEDOS guarantees 99.99% uptime and unlimited storage and bandwidth to all its users. You can create unlimited FTP accounts for subdirectories and make use of the autoresponder and email redirection features concerning emails. The email service is offered in a secure manner with IMAPS, POP3S, and SMTPS. Website security is important for all website owners. WEDOS offers DDoS protection as well as IDS/IPS protection in both its hosting packages. Additionally, every user gets 5GB of free space for backup which ensures that the website can be recovered in case something goes wrong either at the server end or at the user end. The backups are taken weekly. The antivirus and antispam features ensure protection against malicious viruses to keep both the website and your visitors safe. WEDOS only offers two packages. 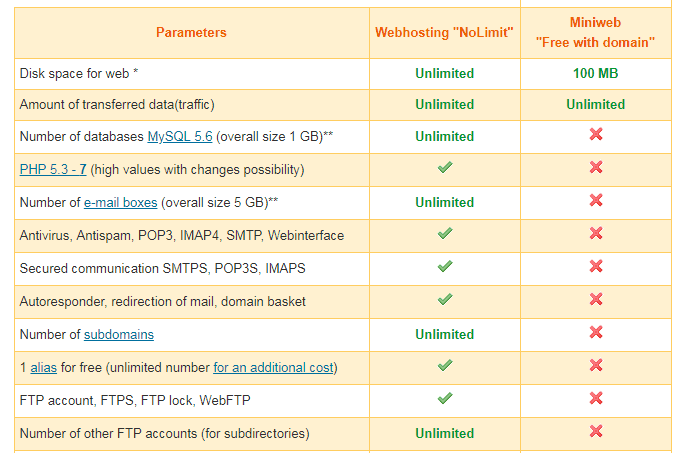 The first one is called the MiniWeb hosting package and offers only 100MB of space with unlimited bandwidth. This package is free and is perfect to get a feel for their control panel and other features. The main package is called NoLimit hosting package and offers unlimited disk space, bandwidth, databases, and email accounts. A free .eu, .pl or .cz domain can be registered with this package. You can utilize the 7-day test period to test their features. Though WEDOS offers 24/7 live chat support, it can only be accessed once you become a customer and get your login details. You can contact them by telephone, through the contact form or visit their knowledge base section to find a solution to your problems yourself. They also have an active forum on their website where you can post your query and wait for someone to help you. WEDOS hosting package is really cheap and offers much more than you can expect with that price tag. Thanks to the 7-day trial period and a 180-day money back guarantee, you can always test their features before committing long term. Be sure to read the terms and conditions of the 180-day money back guarantee before you buy. Wondering how Wedos stacks up against other Web Hosting companies? Enter any other Web Hosting company and we will give you a side-by-side comparison.